In only the second game of its 2015 season, the Boston University men’s lacrosse team will battle out-of-conference foe Canisius College at home Saturday afternoon. The game, which will serve as the Golden Griffins’ season opener, was originally scheduled to be played in Buffalo, New York, but snowy field conditions required that the matchup be moved to Boston. BU coach Ryan Polley said he does not think the location of the game will greatly influence its outcome. BU (1-0) will be playing with confidence after defeating Mercer University 18-6 in its season opener Saturday at the Harvard Stadium Bubble. The dream start to the season was led by the strong efforts of freshman attack Jack Wilson and sophomore defenseman Greg Wozniak, who were respectively named the Patriot League Rookie of the Week and the Patriot League Defensive Player of the Week on Monday. While Wilson and Wozniak led the charge against Mercer (0-1), the Terriers more impressively had nine different players find the back of the net. With the diversity of BU’s contributions in mind, Polley emphasized how essential it was to see players from all units stepping up to the challenge at hand. Adding to the trials facing a young BU team will be the fact that Canisius and BU met in the 2014 season at Nickerson Field in the Terriers’ home opener Feb. 15, 2014. 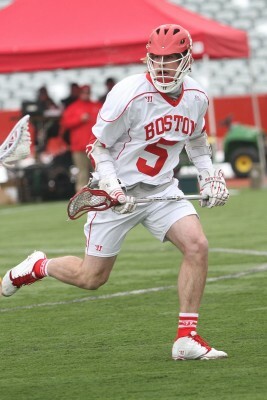 For Polley’s young Terrier squad, things did not go according to plan as BU dropped a 9-3 decision in its second game as a Div. I lacrosse program. Polley said although last season’s game against Canisius provides some context for what to expect, it shouldn’t dictate the final outcome all that much. Canisius returns its top five scorers of the 2014 campaign in senior Tim Edwards, senior Austin Romantic, junior Vince Gravino, junior Billy Jacobbi, and sophomore Jeff Edwards will again don their Golden Griffins jersey come Saturday. In addition to the aforementioned quintet, senior Adam Donner, defenseman Rich Stapleton, and goaltender Alex Govenettio also will return. The Golden Griffins ended 2014 with a 7-8 record went 3-3 in Metro Atlantic Athletic Conference play. For Polley, this level of experience and veteran wherewithal makes the game against Canisius all that more difficult for BU, but not insurmountable by any means. Considering all of the different elements factoring into Saturday’s encounter with Canisius, the Terriers will moreover be looking to build off their performance against Mercer. BU can equal its win total of last year with a victory over the Golden Griffins, but Polley said playing another solid game is the most important thing.